We’ve had a good run in the watershed. The Town of Waynesville has sponsored spring and fall guided hikes in its 8,000-plus acre watershed since 2007. The hikes provide a great way for residents and other interested parties to see this wonderful resource that has been placed in a conservation easement to insure the town has an ample supply of high-quality drinking water for generations to come. During the past 12 hikes we have seen a little rain, a little drizzle, a little fog, a little sleet, a little snow and lots of sunshine. This year we saw rain. We saw lots of rain. And it wasn’t like we didn’t know it was coming. The forecast for the day was 100 percent chance of rain. The skies were close and thick and grey when we met at 9 a.m. at the treatment plant. The impending rain presented an initial dilemma. For the first time since the hikes started we had an entirely new route planned. We were going to start at the top, where the watershed abuts the Blue Ridge Parkway, and hike down and out to the treatment plant, an estimated five miles or so. In the past we have done several routes, either walking in and returning, from the treatment plant or being shuttled in and walking out – all routes offering the option of turning around and heading out at any time. But if we committed to the top we were in it (rain or shine) till we hit the bottom. I know I was stoked for the new route and I think the other guides, perennial hike leader Dr. Pete Bates of Western Carolina University, whose group, Forest Stewards helped create the Watershed Management Plan, Ron Lance, botanist and naturalist at North American Land Trust’s Big Ridge Preserve in Jackson County and Alison Melnikova, assistant town manager and hike coordinator since its inception in 2007, were all on the same page. After a quick huddle, conscience dictated that we offer the alternative of an in and out hike for anyone concerned about the weather. I guess everybody who had those concerns were still home in their pjs, sipping coffee. The hardy crew that showed up (20 or so) was waterproof. We carpooled up to the Parkway, loaded up in the fog and set out. It was foggy and overcast, but so far dry. There was a little semi-bushwhacking, basically avoiding blackberries and greenbrier, before we accessed the watershed. 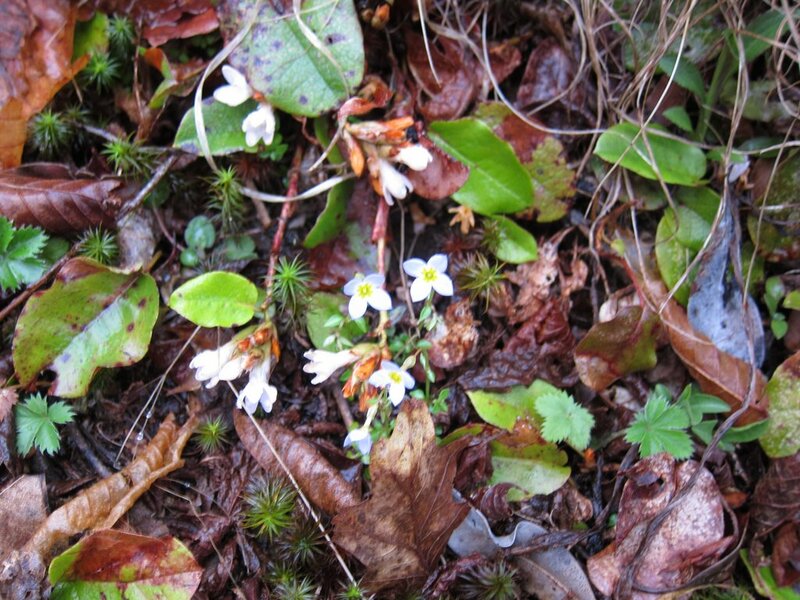 We saw a lot of trailing arbutus and bluets along the Parkway plus one bunny that sat motionless, convinced it was invisible as the horde of humans sauntered past. The sprinters (hikers) hit the descent and quickly found their stride, leaving the amblers with Ron and I to observe our surroundings. We had a good first third of the hike – just overcast and maybe a little foggy drizzle. And there was plenty to see – cut-leaved toothwort, spring beauty, trillium erectum, wood anemone, prostrate bluets, squirrel corn, Dutchmen’s britches, early meadow rue, and bloodroot were some of the wildflowers we saw. We also found a really cool earth star fungi of the genus Geastrum. My daughter Izzy turned logs for us and came up with at least three species of salamanders. I know we had ocoee and blue-ridge two-lined plus one other dusky, I wasn’t sure of the species. And birds were out singing, at one stop we saw/heard black-throated green warbler, blue-headed vireo, ovenbird, and brown creeper. And then the rain came. It wasn’t too heavy but it was steady. A good all day spring soaker that, after an hour or so kind of made all of us hikers. We plodded out and while it certainly wasn’t the best of circumstances, I never heard any grumbling about “wish we hadn’t come, etc.,” in fact there was still the occasion to stop when someone happened on a bloom they didn’t recognize or found an owl pellet, or something caught their eye. Even a drenched day in the watershed is a good day if you’re the kind that revels in what Ma Nature has to offer.